The debate over Golden Rice has heated up again, this time in response to the call from 107 Nobel prize winners (of the 296 living laureates) for Greenpeace to cease campaigning against the nutritionally enhanced crop that its supporters say could reduce Vitamin-A deficiencies causing blindness and death in children in the developing world. The laureates went so far as to question if the NGO’s behavior should be considered “crimes against humanity”. Corporations are overhyping ‘Golden’ rice to pave the way for global approval of other more profitable genetically engineered crops. This costly experiment has failed to produce results for the last 20 years and diverted attention from methods that already work. Rather than invest in this overpriced public relations exercise, we need to address malnutrition through a more diverse diet, equitable access to food and eco-agriculture. 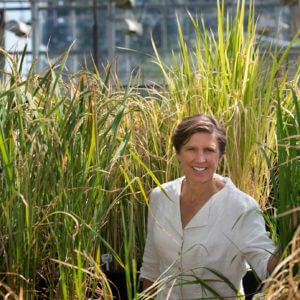 Stone and Glover, both long-time skeptics of the benefits of crop biotechnology, cite in their journal article research by Adrian Dubock, who has served as the project manager for the Golden Rice project since 2008 and is the executive secretary of the Golden Rice Humanitarian Board since 2010. In a letter sent exclusively to the Genetic Literacy Project, Dubock takes issue with the paper and Stone’s comments, which he believes misrepresented his work, the progress of Golden Rice, and the motives of those working on the project. When I was a child in the 1950’s my family didn’t have a TV. But I did see TV in a neighbor’s house. One of the abiding images is of Indian’s in loin cloths standing in line for food handouts: 50% of India has wheat as the staple crop and 50% has rice as the staple crop, and the country was not able to produce enough to feed its population. The Green Revolution had a remarkable impact on food security in India. During the 1960s, India imported up to 10 million tons of food grains per year. For the past 10 years,India has exported 4 to 6 million tons of food grains every year. The quantity of rice exported in 2013-14 was 10.7 million tons—more than any other country. Considering that the population of India has increased from 350 million in 1960 to 1.3 billion at present, this is a remarkable achievement.The present food grain situation in the country is the result of the unprecedented increase in rice and wheat production because of wide-scale adoption of Green Revolution technology. For example, wheat production increased from 10.3 million tons in 1960 to 97 million tons in 2013-14. Rice production increased from 34.6 million tons in 1960 to 154 million tons in 2013-14. Nobody forced Indian rice farmers to buy the improved seeds sustainably over so many rice generations, and I don’t expect the previously hungry of India much care that the rice varieties were not embedded in “the cultural, historic, agronomic, economic and public health contexts” specific to India, which Stone and Glover, clearly serious scientists in their fields of anthropology and environmental studies, think are so important. I don’t expect they much cared either that, as noted by Stone & Glover: “The Green Revolution spread generic, disembedded high input seeds to replace locally adapted landraces as well as peasant attitudes and practices associated with them.” After all, despite the green revolution there are still somewhere above 20,000 varieties of rice for farmers, including ‘peasant’ farmers, to choose to plant. In order to achieve sustainable development, environmental protection shall constitute an integral part of the development process and cannot be considered in isolation from it. All States and all people shall cooperate in the essential task of eradicating poverty as an indispensable requirement for sustainable development, in order to decrease the disparities in standards of living and better meet the needs of the majority of the people of the world. Increasing a country’s self-sufficiency in macronutrients is surely a key part of the above, and more important than the considerations promoted by Stone & Glover. In both cases, wheat and rice production, when Indian’s had enough to eat of either staple, they received carbohydrates – excellent as source of energy, but essentially no micronutrients – minerals and vitamins – essential for human health. With nearly two million under-five child deaths per year, India ranks at the top of all nations’ under-five mortality………… India’s share of global under-five deaths is rivaled only by that of sub-Saharan Africa…. Compared with its immediate neighbors, India has made relatively little progress in mitigating child mortality since 1980.” “The low coverage of India’s vitamin A supplementation program may account for that country’s relative failure in reducing child mortality…….What has made the vitamin A deficiency situation in India so intractable? The probable answer is lack of national leadership in public health and nutrition, leading to inadequate coverage in vitamin A supplementation. There is a close correlation between high vitamin A deficiency, high under-five mortality, and deep poverty. Sadly, this confluence of ills describes much of India. It is remarkable, that Stone & Glover, despite over 100 references to their paper (including one of mine from 2014) and 13 individuals acknowledged—didn’t think to contact either of the inventors or myself for a perspective, or follow up on two other papers of mine referenced in the one they did read: Golden Rice: a long-running story at the watershed of the GM debate and The politics of Golden Rice. A main part of the thesis of Glover & Stone is that Golden Rice is disembedded from “the cultural, historic, agronomic, economic and public health contexts specific to the Philippines”. Except for a brief footnote implying that Golden Rice research in ‘Vietnam, India and Bangladesh’ is unworthy of discussion, they state that because the Philippines is the home to the International Rice Research Institute (IRRI), that the work of IRRI (which was Potrykus and Beyer’s first – of 15 – rice research institute licensees, all the rest of which are national public sector labs) is only designed to benefit Philippine consumers. This is incorrect. 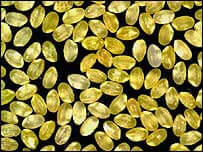 Golden Rice seed is available to public-sector rice-breeding institutions in less developed countries where rice is the staple and vitamin A deficiency endemic. Supply is subject only to national and international regulations, and simple and free agreements. Then using conventional breeding techniques the nutritional trait can be introduced into any locally adapted and preferred variety of rice so that its agronomy, preparation and taste will be the same. Farmers will subsequently, initially using seed from their national seed supply system, be free to plant, harvest, save seed, and locally sell Golden Rice as they wish. There is no reason Golden Rice should cost any more than white rice to the farmer or consumer, and consumer benefit is expected from its health-promoting properties. [Emphasis added]. Thus with respect to locally adapted and preferred rice varieties the Golden Rice nutritional trait can be embedded in “the cultural, historic, agronomic, economic and public health contexts” of each country, and in any variety or rice preferred there – which of course may not be the “heirloom seeds” apparently preferred for all purposes by Stone & Glover: but surely the seed variety should be for local rice breeders to select, not foreigners, whatever their specialization and motivation? Local choices of rice variety are exactly what is promoted by the Golden Rice project. As of today, October, 2011, more than two and a half years on [from the March 2009 Lead Event decision], the selected Golden Rice seed has been supplied to research institutes in only two countries: India and Philippines. The inventors and the public sector Golden Rice licensees in other countries are very frustrated by this slow progress, at a time when multiple rice breeding programmes could be underway in multiple countries. All licensees already have the legal ownership of the Golden Rice trait. They need the physical materials. 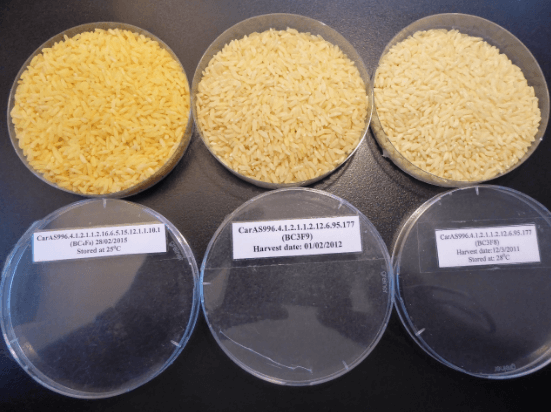 And use of the same physical materials—the same transformation event even in different varieties of rice—is effectively mandated by the regulatory environment. The photo was taken in October 2015, and has not been ‘photo-shopped’. 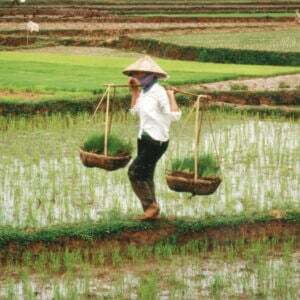 Most resource poor farmers do not store rice for very long because they are short of food. 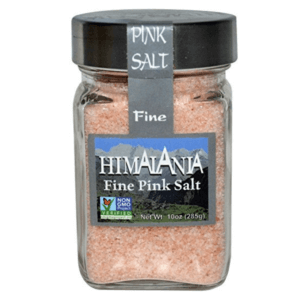 Yet here rice harvested in March 2011 still contains beta-carotene – probably at useful levels indicated by the color – 4 ½ years after harvest. Dr Parminder Virk, IRRI rice breeder in charge of the programme, [in 2009] presented comprehensive data [including the slide reproduced below] ……… covering ten agronomic measurements used by rice breeders as well as carotenoid content and degradation over time” for Golden Rice, and “Carotenoid content degrades rapidly after harvest (as is common in all crops) but in rice the rate of decrease after 2 months was demonstrated to be minimal.” And “All calculations (and subsequent breeding decisions) used only the retained β-carotene content after 2 months of storage. 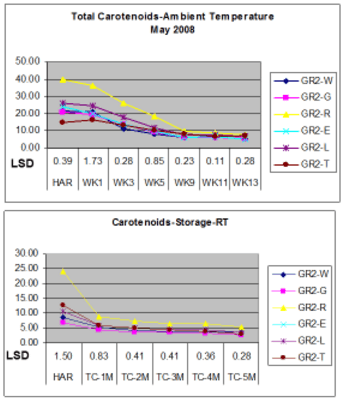 Calculations also assumed 20% losses of carotenoid through cooking, although only 6% losses had been noted…. It seems that Stone and Glover were remiss in not referring to these facts whilst referring to questions about these matters raised by Pénicaud et al (2011), and Michael Hansen (2013). So let’s look at the perspectives of Golden Rice’s inventors and donors, Professors Potrykus and Beyer, The Golden Rice Humanitarian Board, and all the rice institutions and their Governments who have been investing in the project for so long. Important Millennium Development Goals: 1, to eradicate extreme poverty and hunger, and Goals 4 to “Reduce by two thirds, between 1990 and 2015, the under-five mortality rate”, & 5, to reduce significantly maternal mortality, all between 1990 and 2015, despite significant progress, were not met. Notes: * Mostly children Data sources: For 2010 data: Dubock 2013; for 2014 data: UNICEF 2016, West et al. 2010, UNAIDS 2015, WHO 2014a, b. 1.) 1990 UN World Summit for Children, where 50 heads of government and senior government officials committed their governments to the virtual elimination of VAD by the year 2000 (UNICEF, 1990). VAD control is the most cost-effective child health/survival strategy governments can pursue. All sectors of society should support the virtual elimination of VAD. Strategies should include promoting breast-feeding, dietary diversification, vitamin A supplementation and food fortification. 3.) 2004 UNICEF and the Micronutrient Initiative Report ‘Vitamin and Mineral Deficiency’, which concluded that ‘controlling vitamin and mineral deficiency is an affordable opportunity to improve the lives of two billion people and strengthen the pulse of economic development’ and that ‘probably no other technology available today offers as large an opportunity to improve lives and accelerate development at such low cost’ (UNICEF, 2004). Related article: Corporate support for anti-GMO advocacy groups is growing. Do companies know what their money is funding? In adults (in the USA) and most importantly children (in China), careful and sophisticated research has shown that the beta-carotene in Golden Rice, following only a single meal, is very efficiently converted to vitamin A by the human body. Only a few tens of grams of dry Golden Rice, when cooked and consumed daily, is expected to combat vitamin A deficiency and save life and sight. The results show that Golden Rice “may be as useful as a source of preformed vitamin A from vitamin A capsules, eggs, or milk to overcome vitamin A in rice-consuming populations”. 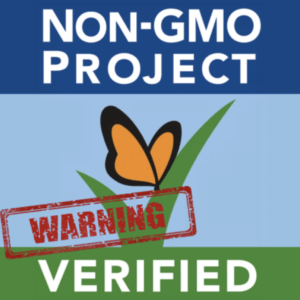 The inventors of Golden Rice, nor their public sector licensees, created the controversy which surrounds GMO-crops, nor have they stimulated the use of Golden Rice in pro-gmo-crop or anti-gmo-crop arguments. All understand that poverty is the principal cause of vitamin A deficiency. They know that the need for cheap and effective VAD interventions with a minimum requirement to adjust cultural practices of crop growth, processing, storage, food preparation or diet remains. In this context it is hard to take Stone and Glover’s criticism of Golden Rice concerning “embeddedness” or “productivism” and “the cultural, historic, agronomic, economic and public health contexts” as a helpful contribution in the real world, despite the consideration that, because gmo-crops are controversial, Golden Rice may provide a platform for more discussion than normal, of their ideas. Adrian Dubock is project manager for the Golden Rice project and the executive secretary of the Golden Rice Humanitarian Board.